Toshiba delivers a wide variety of laptops and notebooks ranging from 12-inch personal computers up to 18-inch gaming system. 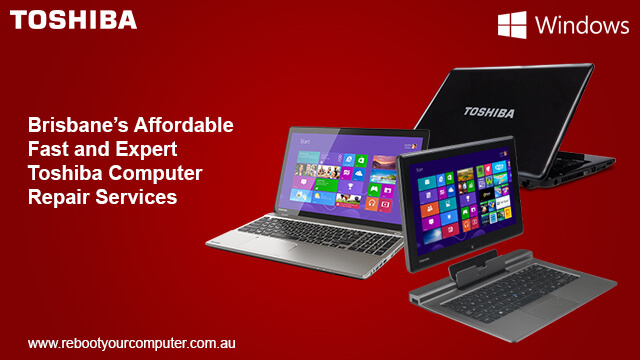 Toshiba is considered to be one of the top sellers in Australia market. Because of being famous in the industry of laptop computers, we get to receive plenty of Toshiba repair jobs from our customers in Yeronga and nearby Brisbane suburbs. 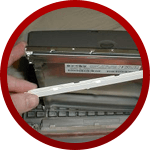 Our extensive experience in repairing Toshiba laptops gives us the better understanding of what are the most common issues with this computer brand. The most common problem we encounter are overheating CPU and GPU mainly because of faulty heat sinks and poor quality ventilation or fan. Reboot Computer Repairs Yeronga offers unparalleled repair service for all kinds of Toshiba laptop models. 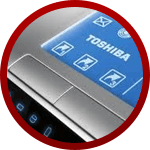 If you have a problem with your Toshiba computer, make sure you bring it to an expert repair technician who has the knowledge and experience to get the job done quickly and effectively. 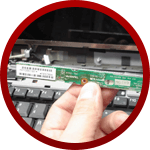 Toshiba DC jack repair and replacement – Having a loose laptop DC jack can be a big problem for making your laptop up and capable of charging. 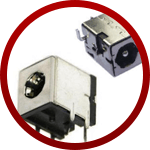 Our experts can repair or replace your computer’s DC jack to ensure that you can use your computer comfortably again. 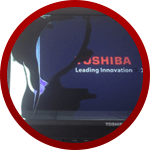 We offer the best repair service for Toshiba in Yeronga. Toshiba motherboard repair – The motherboard is what makes up the software and hardware functionalities of your computer. When your motherboard is damaged, your computer won’t be able to function properly. 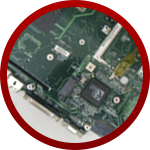 Our experts at Reboot Computer Repairs Yeronga can repair or replace your motherboard so that your computer runs smoothly. 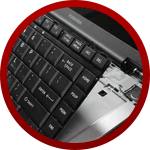 Toshiba laptop keyboard repair and replacement – Our experts at Reboot Computer Repairs Yeronga can provide all kinds of repairs and services for your Toshiba computer with the mission to provide the best services in all of Brisbane! So whether you spilled coffee all over your keyboard or some keys won’t work, rest assured our experts can handle it. Toshiba inverter repair – Does your laptop display seems too dark and making it hard to see images with the right tone and colors? We can have your display inverter checked and repaired. Call Reboot Computer Repairs Yeronga, we offer nothing but the best and most affordable computer repairs and services in all of Brisbane. We would always love to help you on fixing any of your computer problems regardless how big or small. At Reboot Computer Repairs Yeronga, you can guarantee that you will get a service of a professional technician who is fast, polite, punctual and certified with skills. We are committed in giving you the opportunity to save your time and money. Call us now at (07) 3155 2002 with no call out fees and have out experts assess your computer problems quickly, provide you an affordable cost and get the job done right. Toshiba virus and spyware removal – If you are looking for the most effective virus and malware removal in Yeronga or Brisbane, you are in the right place. Our experts offer a dedicated service for malicious software removal for your PC making it 100% clean from any computer viruses. Toshiba internet and network setup – Reboot Computer Repairs Yeronga also provides solution for your network problems including Wi-Fi setup, wired setup, cable setup, network configuration and even internet security concerns.